★【Heat Resistant】Our silicone spatula tongs is heat resistant up to 230 degrees, so you never have to worry about burning the silicone material. Even better is that the stainless steel frame always stay cool to the touch. ★【High Quality】The 2-in-1 spatula and tongs is actually made out of commercial kitchen quality materials making it both stove top and oven safe for added convenience. 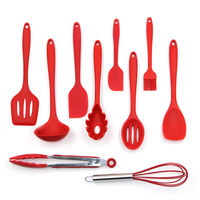 ★【Non-stick】It is made out of non-stick silicone which ensure the food slides back into the pan or onto your plate when you need it to and it will not stick with the food you make. 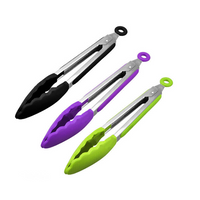 ★【Easy to Clean】The non-stick surface makes kitchen tongs very easy to clean - all you have to do is rinse them off. For an even better clean you can put them in the dishwasher. ★【Multifunctional Use】It can be used for just about anything. You can use it to gently flip your eggs without breaking the yolk. Use it to pick up chicken nuggets, french fries or scoop stir fry,serve eggs.